Soft Chinese mochi dumpling with sweet peanuts fillings, usually served as a dessert. Try this easy Chinese peanut dumplings(Tang Yuan) dessert recipe now! I hope you have had a lot of fun following my Lunar New Year series. To close this festive celebration on a sweet note, here is the much-loved and popular peanut dumplings (花生汤圆) recipe, served in a ginger syrup. If you remember, I posted the popular black sesame dumpling recipe a few years ago (which caused quite a big stir not too long ago) and these peanut dumplings recipe is high on the requested recipe list. 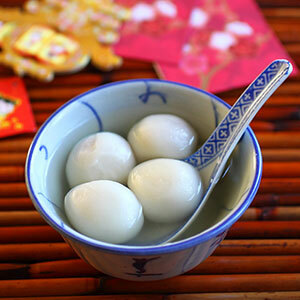 Anyway, Chinese New Year celebration is incomplete without a serving of sweet dessert, for example: Longan Tong Sui Dessert, which was my late mother’s favorite. Peanut dumplings are just perfect as a dessert for Chinese New Year dinner, or as an offering to guests who come to visit during the celebration. I wanted to wish you all happy dragon year and that the new year brings you abundance of joy, great health and prosperity. Mix all the ingredients of the Filling in another bowl until well-combined and that it can be easily shape into a ball. Add a little more peanut butter if your Filling is dry. Divide into 24 balls. In a big bowl, mix the glutinous rice flour with the water until it forms a smooth paste and no longer sticks to your hands. Divide it equally into 24 balls. Flatten each ball in your palm, and then place the Filling in the middle of the flatten ball. Fold the edge to seal the dumpling. Lightly roll it into a ball shape using both palms, very gently and delicately. Make sure the peanut balls are completely wrapped by the dough. Set aside. Prepare the ginger syrup by boiling the water. Add the ginger and screwpine/pandan leaves (optional) into the water and boil for 10-15 minutes with medium heat. Add sugar and boil for another 5 minutes. Lower heat to simmer and reduce to about 4 cups of water. Add more sugar to taste if you like. Heat up another pot of boiling water. Drop the dumplings into the hot boiling water. As soon as they float to the top, transfer them out and into the ginger syrup. Turn off heat and serve the peanut dumplings in a bowl immediately. hi! I’m wondering…can I freeze them? Is it gonna be the same tastes as the first batch? coz I heard from other people that u can’t freeze them it should be eaten right away?! Happy Chinese New Year!!! Dragon Year!!! Your black sesame dumplings are delicious and I am sure these will be too. Try steaming your black sesame dumplings for 8 minutes and then roll in peanut powder. Yummy! At the restaurant, you can order these as Chinese mochi. Gong Hey Fat Choy, Bee! You good cook for me ok? oooo ive been waiting to find a recipe for this, forever!!! Thank you! Gong Xi Fa Cai to all and especially to Baby G.
Wishing you and your family a roaring success, great health, peace, harmony and a compassionate spirit as we welcome the year of the dragon! Gong Xi Fa Cai! Oh, I’ve been hoping you would do a peanut dumpling recipe! I’ve tried frozen ones from the store, but I love the opportunity to cook them myself (when energy allows). I’m pretty sure I have all of these ingredients at home (except for the syrup), so I might make these soon! I live in Manilla, NSW and just wondering where do you buy the frozen packs of peanut dumplings. I can’t seem to find them anywhere to buy online. A friend gave me a couple to try one night and I absolutely love them. These peanut dumplings look wonderful! We also have this for New Year too, but with mung bean and taro for the filling. Hi, i tried out the recipe and used sticky rice flour for the dumplings skin. However, after boiling for about 15-20 mins, it did not float, so i tasted it and it’s hard. It feels like it’s not cook, so i boil it longer and after an hour, it still didn’t float! The dumplings started cracking after that. It tasted a little softer but not chewy and soft enough. I follow the recipe step by step. Everything went well until the boiling part. What could i have done wrong? Even if they don’t float, you should boiler for 5 minutes and should be cooked. Hey Bee, I’m making the same dessert this week, for a sweet start to the year of the Dragon! But I usually prefers to sprinkle over the soup with ground peanuts, the way my grandma used to make it. It look like Indian resgulla but the recipe is totally different, I will try in my home. Are the ground peanuts salted or unsalted? Hi, how much is one cup? Any estimated weigh or ml or something? Thanks. You have to buy an measuring cup for the best results. Unless my measuring cup is somehow off, the dumpling mix is totally off. Needs less water/ more rice flour.